A book came out last year, written by a German author, that outlines the widespread use of drugs in the Third Reich. One of the main drugs was Pervitin, whose active ingredient is methamphetamine - today known as crystal meth. I had come across suggestions of this before, that the German troops favoured methamphetamine while the American troops favoured benzedrine. Both drugs helped soldiers to stay awake, focused their attention and just helped them to perform at a higher level. Norman Ohler, author of Blitzed: Drugs in Nazi Germany goes even farther though and notes that Pervitin was seen as something of a wonder drug and was taken by housewives, truck drivers, train conductors and even Adolf Hitler. "While Adolf Hitler allowed the world to believe he was a teetotaller who didn’t even touch coffee, a man who had thrown his last cigarettes into the Danube, the reality was that he was a super-junkie, addicted to cocaine, the heroin-like eukodal, and a toxic cocktail of narcotics supplied by Theodor Morell, a doctor described as ‘the Reich injection master’." That would certainly explain a lot about Hitler - his manic energy, his crazyness. The thing with sustained use of methamphetamine is that it can lead to psychosis. No wonder then that the German war machine stuttered and died in the latter years of the war. When German spy Josef Jakobs, was captured at Dove House Farm in Ramsey, Huntingdonshire, he had several packets of pills in his pockets. One of the packets was an aluminum screw-top container that contained white pills which Josef claimed "helped one to stay awake". British tests showed it to be methedrine or benzedrine - essentially methamphetamine. Most likely it was a capsule of Pervitin. Perhaps the Luftwaffe crew gave him a vial... or maybe the German Abwehr officers. Or maybe it was just normal to carry around a vial of crystal meth in Nazi Germany. I haven't read Ohler's book yet, but it sounds very interesting. 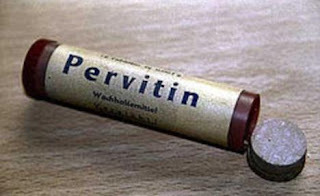 The story about Pervitin use by the troops of the Third Reich is not a new one. A 45 minute YouTube video outlines the history of the drug as well, for those who are interested. Alas, the video is in German and used Google Translate to generate English subtitles which, apparently, are not all that accurate. Daily Mail - Blitzed Krieg: How Nazis rampaging across Europe were fuelled not just by blind fanaticism but CRYSTAL METH - supplied by a cocaine-addicted Fuhrer fed daily drug cocktails by the Reich ‘injection master’ - published online 2016 09 03. Spiegel - The Nazi Death Machine - Hitler's Drugged Soldiers - published online 2005 05 06.